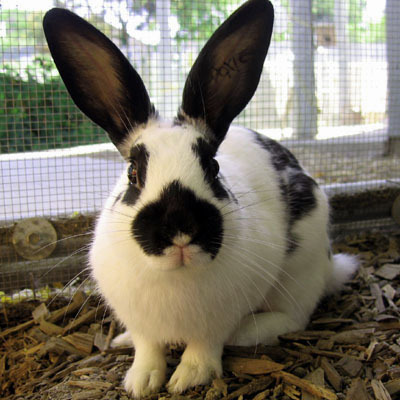 I have been adopted by the Oakland Zoo with my family and a couple new rabbit friends from the Oakland Animal Shelter! Come visit me in the rabbit habitat in the Children's Zoo section of the Oakland Zoo! I was found on the fields of Laney College with my family, and now I'm happily waiting for a safe, indoor forever home. The spots on my face are very symmetrical, black around the eyes and a spot on each cheek with a clover-leaf-shaped blotch above/around the nose. I have a lean body and long ears that make me a good listener and runner. I'm a curious girl and once you sit down at my level, I'll come up to greet you! Check out my cute rabbit dance that I do when I'm happy! Most rabbit people call this a "binky." Watch my video!